As the world marks the 70th anniversary of the atomic bombings of the Japanese cities, the speaker of Russia’s parliament told students in Moscow that a tribunal should try the perpetrators since crimes against humanity have no statute of limitation. 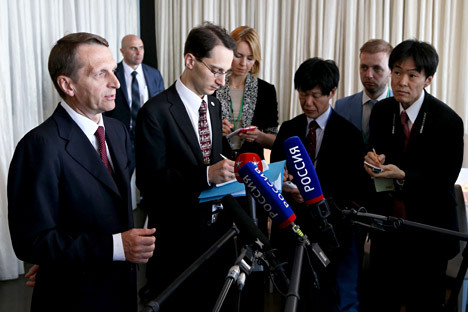 Addressing students at the Moscow State Institute of International Relations, Sergei Naryshkin, the speaker of Russia’s lower house of parliament, said an international tribunal should be set up to prosecute those responsible for the atomic bombings of Hiroshima and Nagasaki in August 1945. “The bombings of the Japanese cities, which were the only instances in human history when atomic weapons were used, have never been subject to an international tribunal. But we all know, that crimes against humanity have no statute of limitation,” he said. Alexander Iliyshev-Vvedenskiy, an official with the Japan division in the Russian Foreign Ministry, said there are documents that show that “there was a real chance to stop the war” before the bombings. He said, Japan had already agreed to surrender on the terms described in the Potsdam declaration. Iliyshev-Vvedenskiy said, on the day of the first bombing, the Japanese Foreign Minister had agreed to surrender on the Soviet Union’s terms, but this information probably reached the Americans. This may have hastened the U.S. decision to drop the atomic bombs, he added. The Russian Foreign Ministry has maintained that the bombings were in violation of the Potsdam declaration, which called for an end to attacks on civilians.